Graphic by Rocío Lara on Flickr and used here with Creative Commons license. Crowdfunding campaigns, when run well, can seem effortless, almost magical, if you’re watching from afar. Seeing the money and backers pile up, especially in the last phase of a campaign, can be breathtaking, when everyone is hugging and high-fiving. 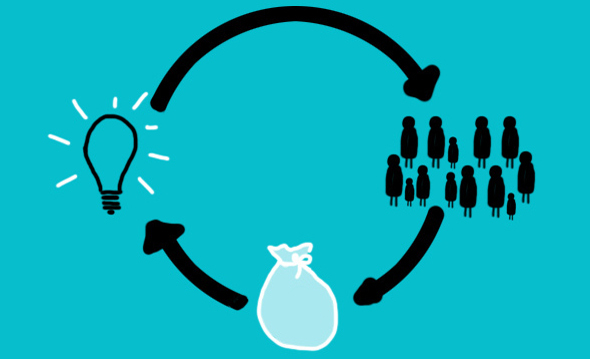 "Crowdfunding is not a walk in the park. Unless that park is covered with broken glass. And a lion ate your shoes at the entrance gate. And he is now chasing you." However, crowdfunding is not a walk in the park. Unless that park is covered with broken glass. And a lion ate your shoes at the entrance gate. And he is now chasing you. There is anxiety, especially during that famous mid-campaign plateau. There are sleepless nights, when instead of counting fluffy sheep you’re counting all of your Facebook friends who haven’t contributed yet. And don’t forget about the obsessive-compulsive “refreshing” of your campaign page to see if there are any new backers. Yes, crowdfunding can be stressful, but if you do the proper prep work — and create the right relationships on social media — crowdfunding can be full of great joy and excitement. Below are some hard lessons I’ve learned after helping run many crowdfunding campaigns. 1. Crowdfunding starts before the campaign launches. The day you launch your crowdfunding campaign is not the day you should start considering whether or not to use Twitter or Facebook. Or Instagram. Or Tumblr. Bottom line: You need to at least be on Twitter and/or Facebook to have a decent shot at crowdfunding, and you need to have been using them for a while. If you’re reading this and want to crowdfund but are not on these platforms, don’t fret; start social media-ing today, and postpone your plans for crowdfunding until you’ve established a solid social media presence. What happens if you start a campaign without laying down the social media groundwork and without that kind of list? This Kickstarter campaign for a documentary about people really into sneakers ended nowhere close to its $100k goal. If you’re not into sneakers, you should know something: People immersed in sneaker culture spend a lot of money on their kicks, so this is a potentially very lucrative niche audience to hook. Unfortunately, it doesn’t seem as though the team behind the documentary connected with their intended audience prior to the campaign. Instead, according to this article, one of the directors thought Kickstarter would find the backers for them. This was not the case. 2. You can’t rely solely on your Facebook friends. Facebook is a great way to get started with social media, but you have to move past your personal Facebook page for crowdfunding success. If you only post your crowdfunding campaign to your personal Facebook page, you will place the burden of the success of your campaign on the shoulders of your friends and family. Don’t do this, unless you want to get uninvited from Thanksgiving. Of course you will promote your project on your personal Facebook page sometimes, because your real life friends want to know what you’re up to and want to support you. But you should also have a Facebook fan page for either your project or a larger entity under which your project will fall. Filmmakers often have a page for their production company so that they can showcase all of their individual movies there, alerting fans of their previous work to their new work. Authors often opt for fan pages for themselves so that fans of previous books can find out about new ones, and so on. Chances are that the project you want to crowdfund for is not the last thing you’re going to do. Make your social media presence a significant and lasting one. 3. The crowd is not looking for you. No matter how amazing your film or book or custom leather bracelet or designer ice cream cone idea is, no one is sitting around flipping through projects on (insert your crowdfunding platform of choice) looking for your project. Yes, all crowdfunding platforms create a hub for your campaign, but no, it’s not their job to drive traffic to your hub. That’s your job. Even a firmly established and trusted brand has to work it to hook their crowd for a new crowdfunding campaign. Kartemquin Films has been making documentaries out of Chicago for just shy of 50 years. They have lauded films such as “Hoop Dreams,” “The Interrupters” and “The New Americans” under their belt. If you’re in the docs industry, you know them. One might think that th e crowdfunding campaign for their latest project, a documentary about Roger Ebert called “Life Itself,” would have no problem raking in the dough, especially with big names like Martin Scorsese and Werner Herzog behind it. But the team behind this campaign is not resting on its laurels. Instead, they’ve created a very active and interactive campaign that draws in long-time Ebert fans and younger cinefiles at the same time. One of their simplest and most effective social media moves: dedicated one of the movie reviews from Ebert’s vast catalog (he wrote almost 8000) to each backer. This is a smart way to use an available resource and welcome each new supporter into the fold. 4. Pick the perfect platforms. what you can reasonably handle in your daily life. For example, if you are a filmmaker, you’re likely posting videos and commenting on the videos of others on YouTube and/or Vimeo. If you have a fashion-themed project, make sure you’re on Instagram. If your project is attractive to foodies, find people who love pictures of food on Pinterest. There is no cookie-cutter plan for social media; you have to find what appeals most to your specific audience. 5. Social media is fast; get pithy and quippy. Yes, your dream project is important and deserves much discussion, but the key to effective social media is hooking people quickly. Tweets need to be short, awesome punches that people cannot resist clicking on and re-tweeting. On Facebook, you can write longer messages, but don’t go into multiple paragraphs; you’ll have plenty of copy to dive into on your campaign home page. And never underestimate the power of a good picture on Facebook. 6. Forget about going viral; focus on being vibrant. Anyone who gives you advice on how to make a “viral” video or “viral” crowdfunding campaign is not trying to help you; they are taking advantage of you. There is no guaranteed way to get millions of people to see your crowdfunding pitch video, so focus on what you can control: giving your crowd consistent (and consistently engaging) messages that remind them that you’re still working hard and that they are still a part of the team. 7. Give it. Give another little piece of your heart. Understand what your audience wants, then give it to them. In some cases, a crowd connects with a creator on a personal level, but how do you do this without TMI (a.k.a. too much information)? In 2012, I consulted on a Kickstarter campaign for Katie Todd, an indie singer who produces her own albums and has a dedicated fan base on Facebook. For every 10 backers we gathered, we released a cute or goofy picture of her from her childhood. This was mildly embarrassing for Katie, but a great incentive for her adoring fans to get their friends to contribute so they could see the next picture. This was a fun (and free) way to make the backers happy while also getting them to do some recruiting. Win-win. These are very basic, and you should put your own shine on them, but you get the drift. You get people on your side without putting your hand in their pockets and, in the course of it, they become invested in your success. A handful of re-tweets (or spreading the word about your project at their office) is way more useful than one $10 donation. 9. Eat your Wheaties; crowdfunding is a workout. Overall, give yourself breaks from the grind so that you can return to your tasks with vigor. 10. After the campaign: Don’t love ’em and leave ’em. Once you’ve met your crowdfunding goal (and even if you didn’t), show respect to those who tried to help your dreams come true. These people are now a part of your project, so keep them up-to-date. Invite them to share milestones with you. Let them know when you send out perks. Let them know when your project gets reviewed. Send them an update when you win your Oscar or Pulitzer. The other side of this is also letting your backers know when things don’t go as planned. If you’re late sending your perks out, notify them. If your book is going to take longer to complete than you anticipated, be honest about it. They’re not going to be mad when you hit a snag; they’ll appreciate that you respected them enough to keep them in the loop. The crowd might, however, start to worry that they’ve been fooled if you fall off the face of the Earth. The only true test of whether or not you can run a successful crowdfunding campaign is actually doing it. Be smart; do your prep work; and try to have fun in the course of it. Julie Keck is a social media and crowdfunding consultant based in Chicago. She has run and consulted on crowdfunding campaigns that have raised more than $300k over the past 4 years, mostly for independent films and webseries. She has spoken about crowdfunding and social media at SXSW, the University of Notre Dame, Columbia College, the Chicago Documentary Film Summit, the Chicago International Film Festival, DePaul, and more. Julie is also a filmmaker, as well as the social media and newsletter editor for MediaShift. You can find her on Twitter at @kingisafink. Julie, appreciate you using @RideTheDivide & @RevealThePath in this article. Building your audience – or knowing your audience is not just smart, I’d say it’s everything. Would you spend two years of your life and hundreds of thousands of dollars starting a business if you knew there were no customers for your product? I strongly believe if you want a sustainable career as a filmmaker or as an artist you need to start thinking of your endeavors as a business. Engaging and building your audience is hard work – it takes a lot of time. But without an audience – well, you have no audience. I recently hinted at the possibility of filming a new project around a specific event and a 100 people quickly voiced their enthusiasm and support within a few hours of the post. It’s perhaps like a band who announces they are almost done with their fourth album and they’ll be touring in the fall and tickets just went on sale. How well that band has built their fan base will determine how well that tour sells. How active have they been on their social platforms – how well did they build their list while on past tours – how much engaging content have they been putting out over the years – Have they been responding to tweets from every single fan – Have they been building allies at radio stations, with music bloggers and entertainment writers? Get where I’m going… if you give of yourself, give your art and give your vision consistently to your audience they will rally behind you when you are ready to ask something from them. Your point is a perfect one: why would you spend years on a movie without making sure there was someone to watch it when you’re finished! Crowdfunding is a great way to get an audience engaged (and spreading the word about) your movie during pre-production, shooting, post-production. People who become invested in the creation of your project are likely to tell others about it, because it is, in part, theirs. Plus, making movies is magical and taps into (almost) everyone’s childhood dream of being a movie star or big movie director. I find that when you give people in other professions the chance to be a part of a film, they really enjoy it, and often find ways to assist other than just chipping in $25 through a crowdfunding campaign. Congrats again on the success of your projects, Mike. Can’t wait to see what you do next! Excellent article. We just did a successful project. – raised $ 9500 with a goal of $ 8500. Last year we did an unsuccessful project – raised $ 600 out of $ 6,000. Clearly there were some major differences. # 1 – we had a topic – a local musician that many many people in this area were interested in and had been touched by – so they were excited to contribute. The second reason I believe it worked out so well is that we were doing the project for a local community radio station that really promoted it on the air. Finally the thing that I would like to mention – the people that contributed were directly connected to our subject, Jim Miller. They had danced to him or knew him personally – somehow they were moved by him and his music. The facebook friends of mine contributed very little in the big scheme of things – of course we were very happy to get the support – but I don’t think I did a very good job of asking them to help – I made that big mistake of asking for money – rather than asking for their help. Anyway – I’m happy with how it worked, and want to see if I can do another one with a topic that is more generalize – we’ll see! Milt, thanks so much for sharing your experience! I, too, have been involved in unsuccessful campaigns, and it ALWAYS comes down to whether or not the audience has been tapped beforehand. It sounds like what you did with your first campaign was perfect. Take care! I am a newbie to crowd funding and I do agree that the article was excellent. I am currently running a campaign and also noticed that my facebook friends have not contributed. There have been some promises to contribute but nothing as of yet. I too asked for money instead of asking for their help. Hopefully I can garner future support by asking for their help later in the campaign. Scheduled posts can take away the drudgery of thinking “Oh yeah, it’s been an hour, I should post”, but someone always needs to be nearby in case a) the scheduled post gets a question/engagement or b) some event makes the scheduled post be a bad idea. For the first, I like to thank people for RTs, engage with people who comment on the campaign, answer questions, etc., and the closer to real time you do it, the more people connect to you and your campaign. Obviously, you can do this as a big batch job at the end of the day if everything was scheduled and you were away from your computer, but it can turn into a huge task at that point plus it’s not real time, so there’s less opportunity for engagement. As for the second, I can’t tell you how many “Hey, check out my awesome Kickstarter” auto-posts I saw in the aftermath of some tragedy, often with people saying “Hey, maybe cool it, did you know…” and then the next auto tweet would arrive with no acknowledgement. So managed scheduling gets a “yes” from me, but a big “no” to “Schedule my day’s tweets and go to the beach”. I hear you, Jeff. Auto-tweets cannot completely replace home-grown, hand-made ones. However, with a little pre-planning (and regular check-ins), I do think they can be a helpful supplement. I used to be 100% against auto-scheduling…until I started running multiple accounts for multiple clients. Now I’ve learned how to schedule, supplement in real time, and respond authentically. Yes, I’ve had to suspend auto-tweets in the face of tragedy (ex. we did that right here on MediaShift in response to the Boston Marathon bombings), but there are usually several of us on hand to halt or alter tweets as needed. The same can be applied to a team of tweeters for a crowdfunding campaign. I think the keys to good use of auto-scheduling, if you go that way, is keeping your signature voice and not becoming repetitive. Thanks so much for chiming in. Great to see you here, dear sir! An absolutely excellent read by someone who understands better than any other filmmakers I know the importance of proper engagement and etiquette not only in crowdfunding, but in marketing one’s own projects and brand. I’ve been in a couple of discussions of late on other platforms, where people are complaining about having to build an audience and accrue some social currency, but as Julie states right there in the first point of this whole article, crowdfunding starts before the campaign launch. For me, it was nine months before, and that’s how I met wonderful folks like Julie and so many others who were among the first people to contribute to my Indiegogo campaign back in 2010. Thankfully I didn’t know anything about crowdfunding when I was doing my “pre-campaigning activities,” so I didn’t succumb to the impatience that many filmmakers and creators suffer from. They want the money, but they sometimes don’t realize that it’s not about the money, but the community. When you engage the one, you’re rewarded with the other. Anyhow, enough of my thoughts, as there’s nothing I could possibly say to add more value to this amazing resource that I will certainly be sharing will all of the campaigners who come to me for advice. Thanks for writing this, Julie! Thanks so much, John. I have much respect for your personal crowdfunding accomplishments as well as your work for Indiegogo. Really appreciate you stopping by! Thank you so much for the insight into crowdfunding- -I’ve never done it but will be using it in the future. Hi – great article. i am getting ready to launch a campaign as well . This is all new to me . I am a little unclear the best approach to getting the word out there. Are people just putting the campaign link on their own FB pages or other social media sites ? How does one keep interest going? If the campaign is to raise funds for a Biz start up, what would be some examples of updates that you might recommend to keep potential contributors engaged?? The article talks about creating a separate page for fans. How would that help as opposed to having an already existing FB page? Any clarification would be greatly appreciated! I was curious about creating a fan page for the crowdfunding as well. Obviously there needs to be people who like that page for it to make a difference, so would you push it out to your personal FB friends to like and share with their friends? I’m pretty new to crowdfunding as well and have been using the Paragon Induction Cooktop on Indiegogo for inspiration (http://bit.ly/1Bindiegogo). They are already past funding!